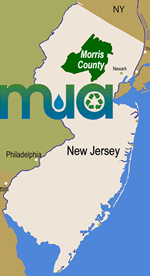 The MCMUA offers three major programs to help Morris County residents, businesses, and municipalities safely manage their household hazardous (HHW), hazardous and special wastes. Call (973) 829-8006 with questions. or click here for a brochure describing Morris County's HHW program. In 1998, the MCMUA opened a year-round household hazardous waste facility located at the MCMUA’s Mount Olive transfer station. This facility operates by appointment only on select Tuesday and Friday mornings, from 9 a.m. to 11:30a.m., and most Saturday mornings, from 8 a.m. to 10:30 a.m. Using the facility is free of charge to Morris County residents delivering residential HHW (fees are charged, however, for propane cylinders and latex paint if delivered). Out-of-county residents may also deliver their HHW by appointment; however, there is a $1.50 per pound handling fee applied to out-of-county residents that is payable by check at the time of the delivery. Eligible Very Small Quantity Generators, commercial or governmental (VSQGs), from inside or outside of Morris County, may use the facility for a $1.50 per pound fee. You must call (973-829-8006) first to schedule an appointment and discuss the materials being delivered. Payments must be made by check at the time the waste is being delivered, and the checks must be made payable to the MCMUA. Business waste materials, including e-waste, may be accepted at the MCMUA permanent household hazardous waste facility as long as the business meets the requirements for being a VSQG of hazardous waste. To meet these requirements, the business cannot generate more than 220 lbs. of non-acutely hazardous waste or 2.2 lbs. of acutely hazardous waste in one month, or accumulate no more than 2,200 lbs. of non-acutely hazardous waste on site at any time. Very Small Quantity Generator (VSQG) Approval Form - Must be completed by all VSQGs prior to establishing appointment to drop-off any hazardous waste. Call the MCMUA for an appointment at (973) 285-8394, Monday through Friday, from 8:30 a.m. to 4:30 p.m. In addition to the permanent HHW facility, the MCMUA continues to operate several individual HHW disposal events at differing locations. At least one HHW disposal event per year is held at the Morris County Public Safety Training Academy. All HHW disposal events are held either in the spring or the fall and serve Morris County residents with residential HHW. Note: Businesses, municipalities and out-of-county residents are not allowed to participate in the MCMUA one-day HHW disposal events. Please note, starting in 2018, the one-day hazardous disposal days ceased accepting any E-waste. Pleasec call 973-829-8006 for information and to discuss recycling options. There are no maximum amounts of household hazardous waste that Morris County residents may bring per visit, except no more than 55 gallons of used motor oil and no more than 100 lbs of asbestos per person. Note: no one may drop off 100 lbs of asbestos multiple times as a means to dispose of more than 100 lbs of asbestos as part of the MCMUA's hazardous waste program. Materials will not be accepted in containers larger than five gallons in size. All materials must be in clearly marked containers with the contents identified. Beginning in 2018, the one-day hazardous waste disposal days no longer accept any mandated electronic waste for recycling. Please call	973-829-8006 for information and to discuss recycling options at our permanent hazardous waste facility which requires an appointment for drop off. automotive fluids such as oil, antifreeze and brake, diesel, ransmission and steering fluids, etc. batteries, if they are rechargeable (NiCd, NiMH, Lithium-Ion) and/or hazardous dry-cell batteries (button-cell and lithium). Alkaline batteries are not hazardous and are not accepted (put them into the garbage). household hazardous cleaning products - must be considered hazardous but note, most are not hazardous. E-waste and/or used consumer electronic waste is not accepted at one-day hazardous waste disposal events. Dried, hard, solid latex paint or empty paint cans; these are accepted for disposal at the transfer stations with other non-hazardous solid waste. Residents should remove the lids from these dried-out cans and dispose of both types into their household garbage. Latex or water-based paints are not hazardous and are not accepted at MCMUA hazardous waste disposal programs. Latex paint may be safely disposed of in the garbage when it is dried out. Dry out latex paint cans by stirring absorbent material such as cat litter into the paint. The paint will harden within a few minutes. Leave the lid off the can, put the lid and the can into the regular garbage. A hazardous waste handling fee of $1.50 per pound is charged for latex paint. Latex paint will not be accepted whatsoever during one-day hazardous waste disposal events. Appliances such as microwave ovens, washers, dryers; freon-containing appliances such as refrigerators, freezers, air conditioners, humidifiers. How do I get rid of paint? Click here for information regarding management of paint, including latex paint. Click here for information regarding management of electronics (E-waste). How do I recycle refrigerators, air conditioners or dehumidifiers with freon or CFCs? Click here for information regarding management of appliances and freon or CFCs. How do I dispose of smoke detectors? Click here for information regarding the disposal of smoke detectors. Q. Can a business use the MCMUA hazardous waste program? A. Pre-qualified businesses and institutions determined to be a Very Small Quantity Generator (VSQG) may drop off hazardous waste at the MCMUA's permanent HHW facility located at the Mount Olive transfer station by appointment and for a $1.50/lb. fee. Very Small Quantity Generator (VSQG) Approval Form - Must be completed by all VSQGs prior to establishing appointment to drop-off any hazardous waste. Business or institutional waste is not accepted at MCMUA one-day hazardous waste disposal programs. Q. Are there rechargeable battery recycling programs for businesses? Call2Recycle® will provide free-of-charge drop-off boxes to any business for the collection and recycling of their own rechargeable batteries. All one has to do is sign up online at http://www.call2recycle.org. Retailers open to the public will be listed on the Call2Recycle® zip code locator and toll-free help-lines to encourage residents to recycle. Additionally, businesses can still participate in the Call2Recycle® program without being advertised as a public drop-off location if they do not want to listed as such. Since everything is free of charge, the MCMUA is encouraging every business and/or public agency to request a drop-off box for its office or work site. Click here for more information about household battery recycling/disposal. Q. Can a governmental institution and/or school use the MCMUA hazardous waste program? A. Pre-qualified institutions may drop off hazardous waste at the MCMUA's permanent HHW facility located at the Mount Olive transfer station by appointment and for a fee. Institutional waste is not accepted at MCMUA one-day hazardous waste disposal programs. Call 973-285-8394 for more information. Q. Can governmental institutions recycle rechargeable batteries with Call2Recycle® ? Call2Recycle® will provide free-of-charge drop-off boxes to any public entity for the collection and recycling of their own rechargeable batteries. All one has to do is sign up online at http://www.call2recycle.org. Public drop-off sites open to the general public will be listed on the Call2Recycle® zip code locator and toll-free help-lines to encourage residents to recycle. Additionally, institutions can still participate in the Call2Recycle® program without being advertised as a public drop-off location if they do not want to listed as such. Since everything is free of charge, the MCMUA is encouraging every public agency to request a drop-off box for its office or work site. For those public entities that utilize 2-way radios such as police, fire, public works and emergency services, the Call2Recycle® program is a great way to conveniently manage the rechargeable batteries that are generated and need to be recycled. Click here for more information about household battery recycling/disposal.